From trendy trainers to boho tops and backpacks, Aldi’s Specialbuys Kid’s Spring Fashion Range has everything parents need to freshen up their little one’s wardrobe for the season ahead, available in stores and online from 19th March. With children’s Animal Backpacks (£7.99) in cheeky characters are an adorable accessory to brighten up the school run. Available in Monkey, Rabbit, Unicorn or Dinosaur designs, they also come complete with fun pull zips, perfect for safely storing prized possessions. Youngsters can stay on trend this spring with Aldi’s stand-out new season designs such as the Girl’s Boho Top (£3.99) in jersey with frill cap sleeves, embroidered woven front yoke and lace trim or this lightweight Girls’ Denim Dress (£5.99) with antique brass buttons front. It’s perfect for springtime adventures and is available in a range of sizes from 3-12 years, with short sleeves for younger girls and a smarter long sleeve and collar for older girls. 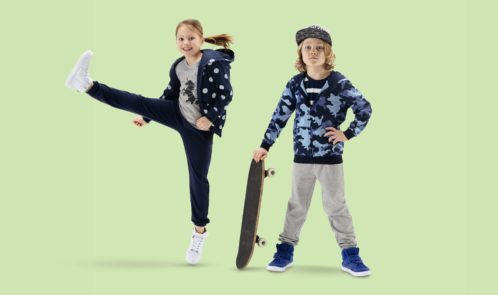 Kit out the kids for playtime with these comfortable and stylish Zip Through Hoody (£4.99) and Slim Fit Joggers (£5.99 for 2 pairs), available in a range of girls’, boys’ and unisex designs in sizes 3 through to 12 years. Aldi’s cool Children’s T-shirt 3 Packs (£4.99) are great for warm spring mornings and come in a range of designs to suit every style – from chic stripes to sporty prints, they are perfect for layering. For a complete spring look, boys are sure to love these tassel Loafers (£6.99) in blue or tan, while girls can slip in to a pair of pink sparkle or denim Canvas Pumps (£4.99). Trendy lace up Hi Top Trainers (£7.99) with touch/close fasteners will have kids jumping for joy. Shoppers can choose from Boys’ Navy Suedette or Girls’ White with YKK Zipper – available in sizes 10-12. Aldi’s Specialbuys Kid’s Spring Fashion range is available in stores nationwide from 19th March and can be pre-ordered online at www.aldi.co.uk from 12th March, but be quick, as with all Specialbuys, once it’s gone it’s gone!